Puppies are born on 10th June!!! They are 5 females and 4 males in black, red and blue merle! Jobsharing in the whelping box! Finally we have found THE ideal and ingenious stud dog for our female Jenna. We sticked to our principles and have had a long search for a stud, which health results (pedigree and tests) and natural left nothing to wish! This mating will be Zoom's first in Germany. With a click on his name you will get to his own webpage. Zoom's photo gallery you will find at "Smugmug Photo Gallery". Puppies will be born in summer 2009 in june / july. We are just waiting for Jennas heat and will tell you the exact date as soon as possible. Thank you, Gina Larson, Windmill Aussies, for your great trust in us, to enable us as one of the three first breeders in Europe a litter with this wonderful and talented dog! We are very proud about that and look forward really excited! Zoom is a black bi male, red factored and docked (long full tail at birth) . We expect puppies in all colors. All will be free from Multiple Drug Resistance (MDR1) an hereditary cataract (HSF4) because Jenna and Zoom are. 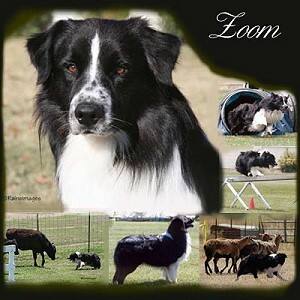 But the real special of Zoom is his versatility: he is a great agility dog, an awesome herding dog and a beautiful and expressive conformation dog also. A really multitalented sir! He is a moderate typ, intelligent and biddable, exactly striking the standard! His pedigree shows on sirs site the working lines Windsong, Little Spot and Twin Oaks, - on dams site we see the beauty of conformationdogs. Jenna isn't as famous than Zoom, but she also has won some nice ribbons in the conformation ring and has fun working agility, obedience and frisbee. She has succesfull passed the german BH-test, has a CD title and starts in obedience class 1. I will set up a photo site, where you can see her fun when working better than words can explain. You will find a link in the next days. Jenna gave us great offspring so far, all healthy and happy and succesful in different areas, - in dogsport, as therapiedog, in the showring, working in a dog school and of course as familydogs. 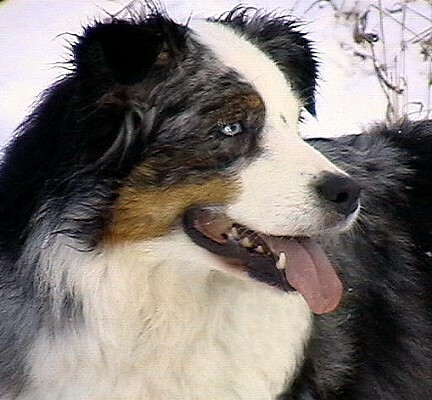 She is the dam of all Stormbringer Aussies. We expect beautiful and talented puppies, able to do all! For these puppies we are looking for future owners, who have experience with herding dogs and want to be active with their dogs. These puppies will need a job! If you are interested in this litter please feel free to ask any question you have (we do also :-))! We want to have early contact with the new puppy owners. Also we want to stay in touch with you a dog life long!